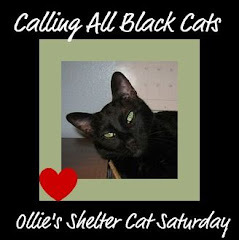 Not only do we love our black cats here on Ollie's blog, but we have a real soft spot for special needs children. And this little boy is precious. He has a bit of wiggle in his walk that is the side effect of a run in with panleukopenia. Goodness he is cute. 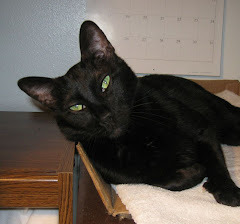 If our Inn wasn't so full (19) we sure would take him.Hope he finds to most wonderful home. We are sending purrs that he does find a great human. Oh what a little sweetie! We hope his furrever human finds him very soon. Greg got adopted by the perfect family last week! His new family also adopted another kitty! So now he has a new sister!! They named him ZigZag and they love him Sooo much!! Thanks so much, Ollie!! !